My beloved Kim Ji Won is in so ofc I'm in. Though I'm excited with the whole cast, hopefully KES will have sth new for this drama. I couldn't watch Heirs, please stop with the stereotype characters..
Jin Goo... so happy he is in this project!!! so so so happy!!! Song Hye-kyo and Song Joong-ki to star in "The Descendant of the Sun"
Actors Song Joong-ki and Jin Goo, actresses Song Hye-kyo and Kim Ji-won-I are starring in the KBS 2TV drama "The Descendant of the Sun". "The Descendant of the Sun" looks through the values of life through doctors and young soldiers who dream about love and success in a hostile environment. Song Joong-ki and Song Hye-kyo take on the role of Special Forces dispatch troops leader Yoo Si-jin and attractive doctor Kang Mo-yeon. Song Joong-ki is on National Duty until the 26th of May and after he has had time to fully prepare for the drama, he will join the team. Song Hye-kyo is currently known as the Hallyu Goddess in China for her outstanding acting skills and therefore, news of the two stars foresees a great response. In addition, there's Jin Goo and Kim Ji-won-I who will take on the roles of Officer Seo Dae-yeong under Yoo Si-jin and army surgeon Yoon Myeong-joo. Writer Kim Eun-sook who has mesmerized viewers with her trendy writing in "Lovers in Paris", "Lovers in Prague", "Secret Garden" and more, is collaborating with writer Kim Won-seok from "The Queen's Classroom". "The Descendant of the Sun" is expected to have humanism that pounds the heart and be filmed in locations on a different scale. "The Descendant of the Sun" will start production soon and be released in the later end of 2015. On April 2, the drama’s production company announced that the main cast will consist of Song Joong Ki, Song Hye Gyo, Jin Goo, and Kim Ji Won. Fans have already begun to express their anticipation for the drama, as it will be a meeting of two top stars that have been recognized for their acting abilities in a variety of genres. The drama is expected to begin airing during the second half of the year on KBS. What are your thoughts on the casting? It’s much appreciated for KBS to provide a complete news update on the casting status of upcoming high profile prime time drama Descendants of the Sun. The drama didn’t just confirm the two leads today, it went ahead and confirmed the second leads as well. For many folks this news is both a relief that casting is done as well as something to look forward to if any or all of of the actors or actresses participating is right up your alley. The drama confirmed today that the leads will indeed be the rumored coupling of Song Joong Ki with Song Hye Kyo, making a new Song-Song onscreen couple that hopefully will sizzle rather than fizzle. Joining them to round out the main leads will be mostly movie actor Jin Gooand rising actress Kim Ji Won as the second leads. The drama heads into full pre-production this June with an eye towards an October air date in Korea, with reportedly a simultaneous airing in China whether streaming online or on a television network. This will be a drama land return for three of the four leads after a few years away. Song Joong Ki’s last drama was Nice Guy in late 2012 after which he shipped out to the army (has it really been that long?) while Song Hye Kyo did That Winter, the Wind Blows in early 2013. Jin Goo’s last drama was also in early 2013 with the lowly rated Ad Genius Lee Tae Baek but he will be seen on the small screen next week in a cameo role in the jTBC drama Falling for Innocence. Kim Ji Won worked with DotS screenwriter Kim Eun Sook‘s last drama Heirs so it’s no surprise to see her make a return as the second female lead here. DotS will be set in a fictional war torn country that is currently dealing with a humanitarian crisis after a recent earthquake hits the already beleaguered nation. Song Joong Ki plays a UN peacekeeping troop commander while Song Hye Kyo is a doctor from Doctor’s Without Borders working in the crisis zone. Both second leads will be subordinate officers reporting to Song Joong Ki’s commander in the troop, and they will also be exes who are still not fully over their breakup. Filming will take place overseas and within Korea, all standing in for the crisis territory as the story line will be set almost entirely outside of Korea. Wow this is a good news..I'm so excited... I've bookmarked this thread already when I heard that this was offered to Song Hye Kyo and Joon Ki... I miss Hye Kyo I'm glad she's returning in a small screen... And this was joon ki's comeback from military too... Looking forward on seeing their chemistry... woah even korea's blair waldorf kim ji won is in... Gaaaahhh I'm so excited!... I'll be stalking this thread from now on.... Song couple fighting!! waking up and see the good newsss kyaaaaaaa....my oppa!!!!! The new KBS 2TV drama "Descendants of The Sun" starring Song Joong-gi, Song Hye Kyo, Jin goo, and Kim Ji-won (a drama by writer Kim Eun-sook and Kim Won-Seok, direct and production by Barunson NEW) will be simulcast in Korea and China. KBS authority said KBS drama "Descendants of the Sun" will be broadcast later this year, and will be simulcast in Korea and China. Official said, " the descendants of the Sun" will broadcast in Korea in China and can be viewed at the same day, same time telecast. he added "it is on the broadcaster channels not streaming on the Internet." Meanwhile, "Descendant of the Sun" is a melodrama that capture human life through a relationship between young soldier and doctor that looking for love and ultimate success in the foreign land. Joong-ki's acting is suitable for melodrama genre...his face is melancholy and that's his best trait to get every woman heart who watch his drama... SHK also a great actress i enjoy all her dramas and movies...ji won's acting is also improved...she act well with so ji sub... A list leads and production crew...rooting for this drama! Actors and actresses Song Joong-ki, Song Hye-kyo, Jin Goo and Kim Ji won were confirmed to make their appearance in new television series ‘Descendants of the Sun’(script written by Kim Eun-sook and Kim Won-seok, directed by Lee Eung-bok, produced by Barunson and NEW). ‘Descendants of the Sun’ is a melodrama that will depict a story of young doctors and soldiers and their dream for love and success in life despite extreme situations in a new strange land. Song Joong-ki and Song Hye-kyo were cast to play the roles of ‘Yoo Shi-jin’ and ‘Kang Mo-yeon’, the head of overseas dispatch of the army in special forces and attractive doctor respectively. The two Songs are expected to show the chemistry in romantic relationships. However, as Song Joong-ki is currently in the military service, the shooting will not start until May 26, the day of his discharge from the army. In addition, Song Hye-kyo, who is maintaining her active career in not only Korea but also in China, is said to come back on the small screen after a quite long absence, which is drawing great attention from her fans. 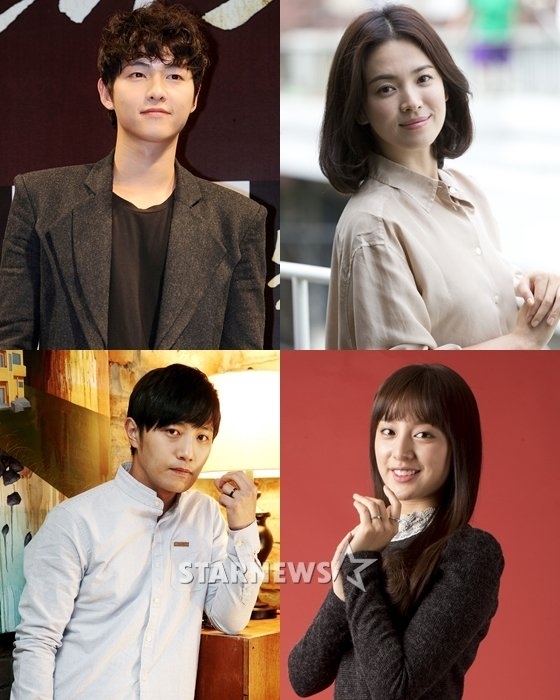 Also, for the supporting characters, Jin Goo and Kim Ji-won have joined the team, to add spice to the drama. Jin Goo was cast as ‘Seo Dae-young’, non-commissioned officer of the special forces. On the other hand, rising actress Kim Ji-won was cast to play the role of Yoon Myung-joo, a dispatched army surgeon, who will depict a love story with ‘Seo Dae-young’. Renowned screenwriter Kim Eun-sook, who has written numerous popular dramas from ‘Lovers in Paris’, ‘Lovers in Prague’, ‘Secret Garden’, ‘Gentleman’s Dignity’ to ‘The Heirs’, is going to team up with another recognized partner, Kim Won-seok who has written ‘Queen’s Classroom’. The duo is expected to draw more viewers than they have ever drawn. Meanwhile, ‘Descendants of the Sun’ will begin shooting upon finishing its pre-production, and will air in the second half of 2015.
here's some of the top comments..
[+1,191, -67] Song Joong-Ki is so awesome!!! most of the comment bashing on SHK.. i feel bad when translate it..they're still can't let go about SHK tax evasion issue.. that's really childish..k-nets always like this when a-listed star caught in a scandal/problem.